Dr. Energy Saver seals air ducts for maximized energy efficiency, as part of a program designed to save you up to 40% on your heating and cooling bills. We'll inspect your ductwork as part of our Free Ductwork Estimates. 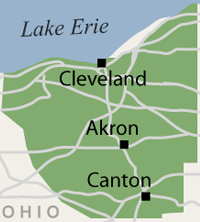 We service Canton, Akron, Cleveland, Lorain, Elyria, Massillon, Medina, Strongsville, Lakewood, Chagrin Falls, Hudson, Cuyahoga Falls, Ravenna, Bedford, North Royalton, Westlake, North Olmsted, Wooster, Painesville, Alliance, Kent, North Canton, Beachwood, Barberton, Willoughby, Gates Mills, Stow, Brunswick, and surrounding areas in Ohio. Indoor Air Quality: If you have leaks in your return ducts, you may be sending "bad air" directly into your living space, where the system runs. You wouldn't want to breath air from your crawl space all day long, but if you have an uncontrolled leak, this may be the case. Leaky ducts may also create "pressure imbalances" that keep some rooms under positive pressure and others in a slight vacuum. If this happens, you may have unhealthy air (laden with dirt, dust, pollen, allergens, and other contaminants) sucked into your home. Safety: Pressure imbalances caused by leaky ducts can lead to back drafting in combustion appliances such as furnaces, wood stoves and gas ranges. When this happens, you risk exposure to carbon monoxide. Up to 40% of the energy usage of your HVAC system could be wasted by leaky ducts. It's extremely important that you include ductwork testing and evaluationin your home energy checkup. Dr. Energy Saver provides ductwork estimates, to increase energy efficiency, to Greater Cleveland, Akron, Cleveland, Canton, Medina, Massillon, Lorain, Elyria, Strongsville, Chagrin Falls, Lakewood, Hudson, Cuyahoga Falls, Ravenna, Bedford, North Royalton, Westlake, North Olmsted, Wooster, Painesville, Alliance, Kent, North Canton, Beachwood, Barberton, Willoughby, Gates Mills, Stow, Brunswick, and neighboring Ohio areas.